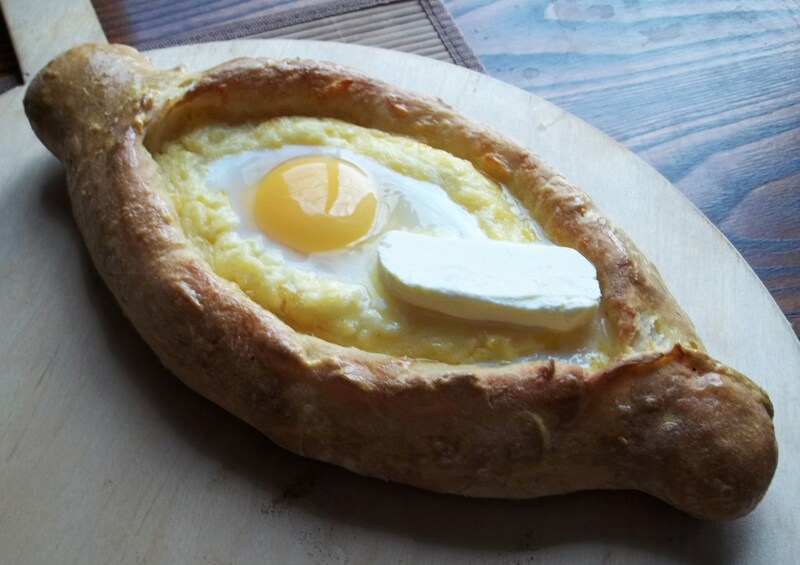 Khachapuri (Georgian: ხაჭაპური), is a filled bread stuffed with melting cheese and often served sliced, like a double-crust pizza. It is justifiably considered to be one of Georgia’s national dishes and is popular in restaurants and in homes. Ajaruli or Acharuli (Georgian: აჭარული ხაჭაპური) – Ajarian khachapuri (from Ajara), in which the dough is formed into an open gondola shape and is topped with a raw egg and butter before serving. 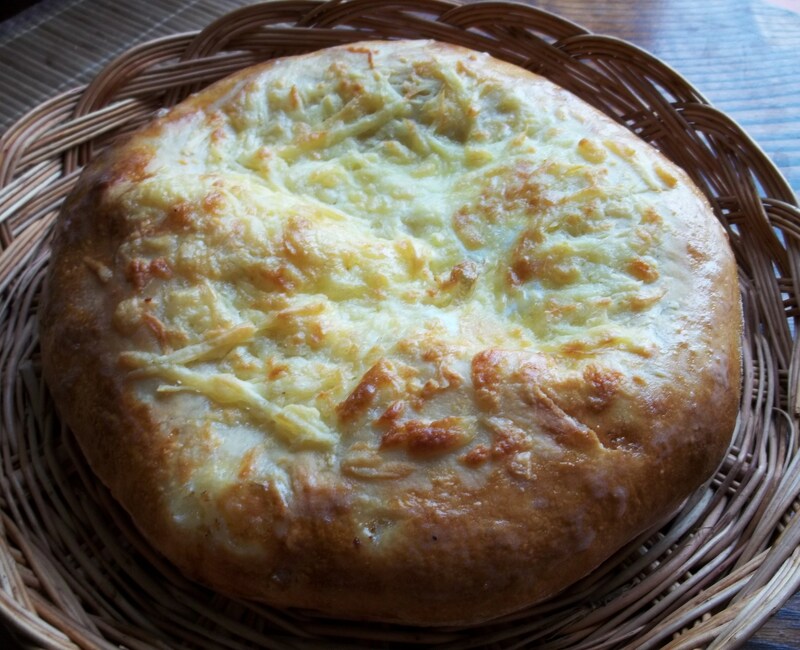 Megruli (Georgian: მეგრული ხაჭაპური), Megrelian khachapuri (from Samegrelo), circular with cheese added on top. 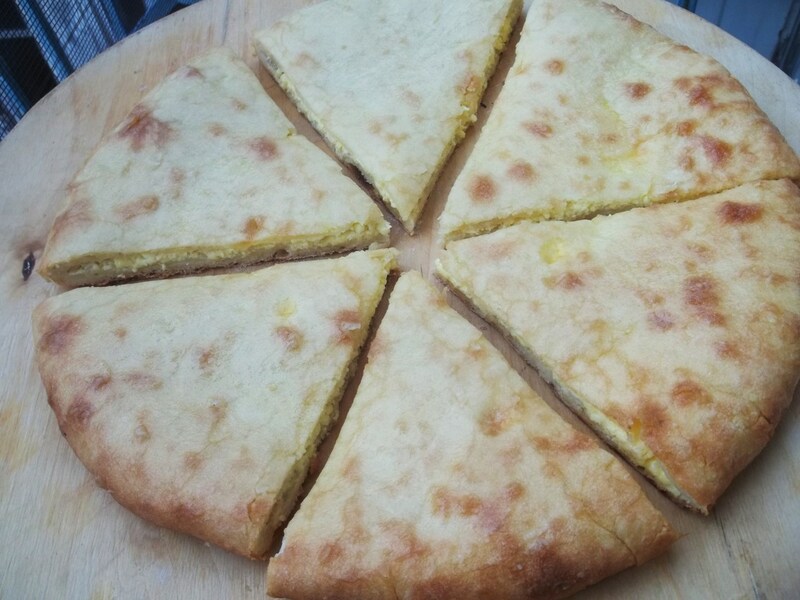 Imeruli (Georgian: იმერული ხაჭაპური) – Imeretian khachapuri (from Imereti), which is circular and probably the most common type. There are several recipes but we find this one the easiest way to prepare the dough and we used this method to make all three types of khachapuri mentioned in this article. 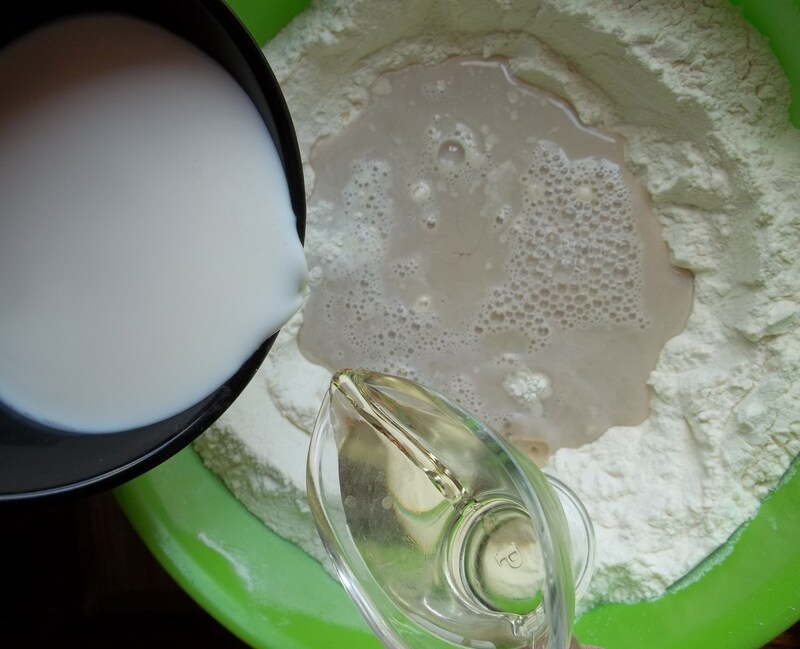 1.15 kilos of flour, 200 ml of water, 200 ml of milk (or water), 1 egg, 1 tbs of yeast and 50 ml of oil. Warm the water to 35C and stir in the yeast. 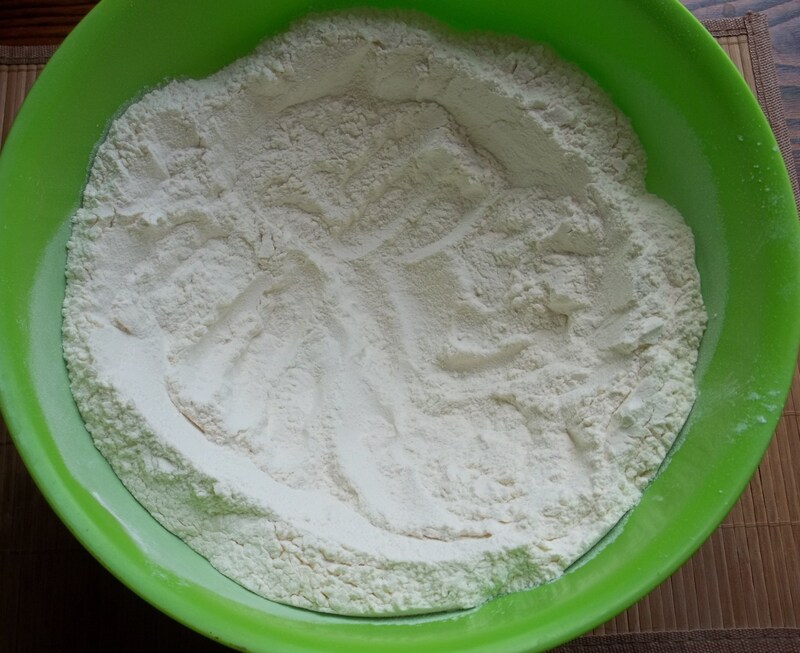 Add 1 kilo of flour to a mixing bowl and make a depression in the flour. 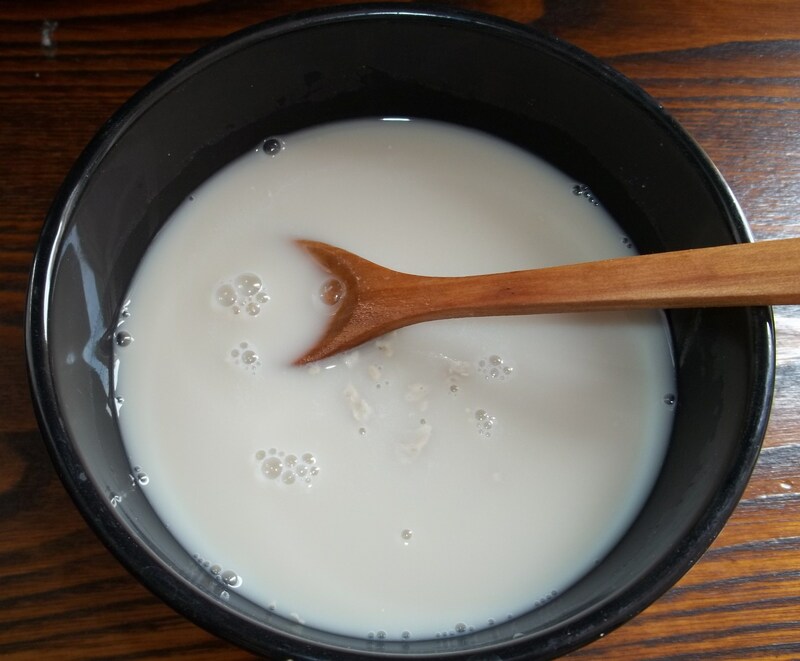 Add the yeast water, oil, milk and a raw egg. If you want the bread to have a golden color you can add 1 tsp of sugar. Cover the bowl with cling film and leave in a warm place for 2 hours. 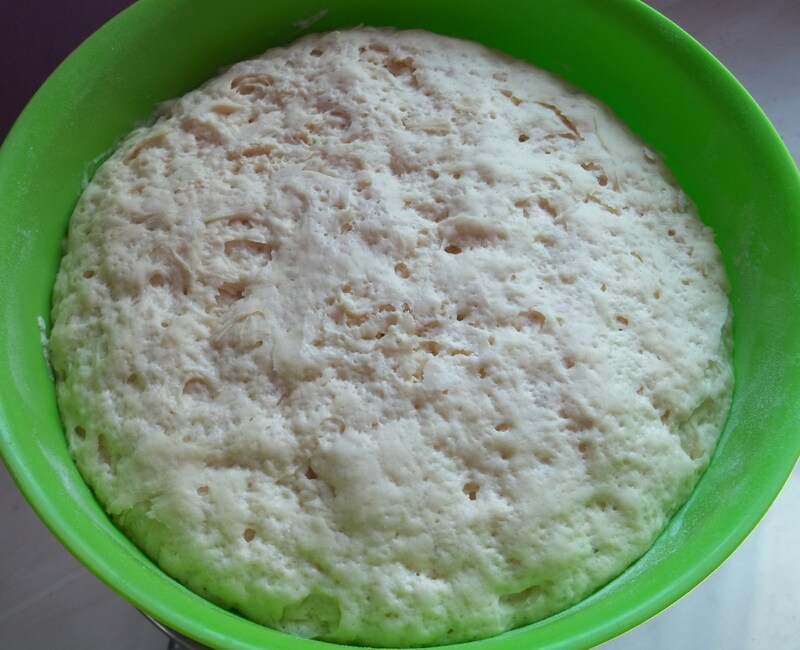 The dough will rise and look like the picture below. 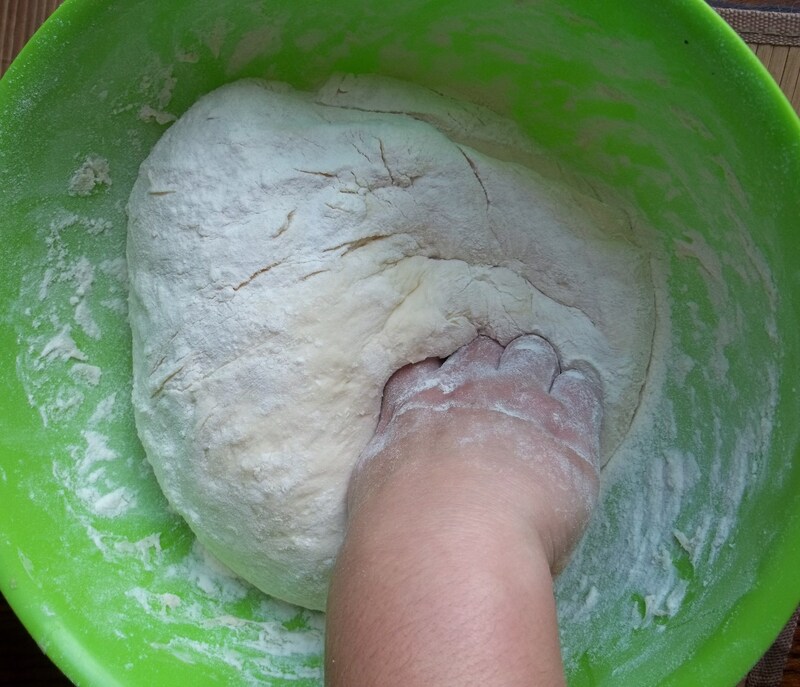 Add 150 grams of flour and knead the dough. 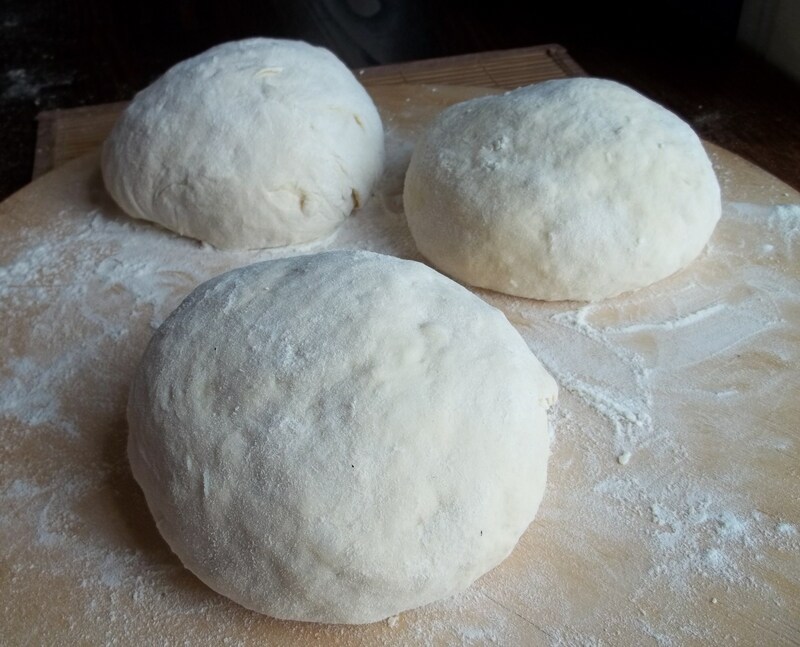 The dough is sufficient to make 3 khachapuri. 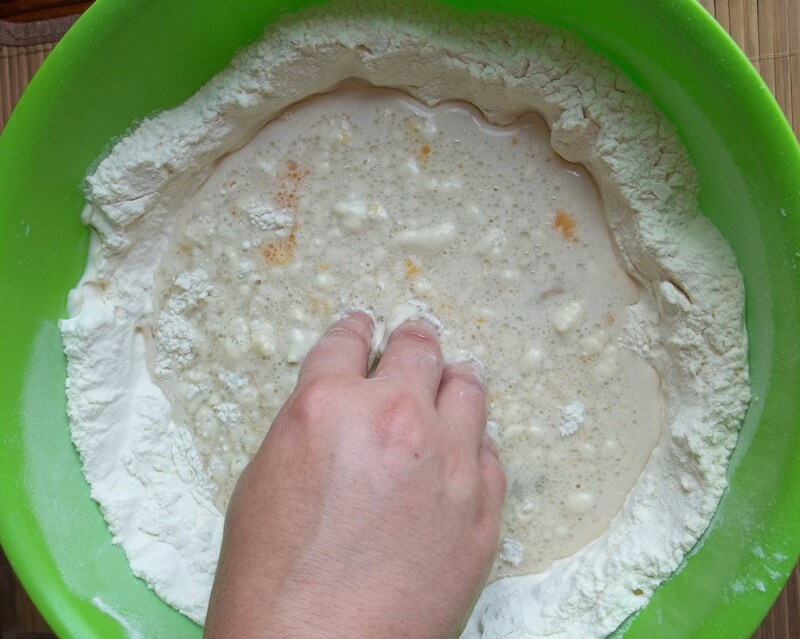 Separate the dough into 3 pieces as shown in the picture below. Congratulations, your dough is now ready to make khachapuri! ← About Development – Georgia Loves the Internet! Looks fantastic! I’m waiting for the other recipes! These posts make me hungry! I’m not much of a cook, but your great instructions do make it seem possible. I’ll have to give this one a try. By the way… have you heard of the blog “A Year of Reading the World” by a British journalist who is reading a book from every country in the world this year in honor of the olympics? (She must never sleep!) She only has one suggestion from Georgia so far, so I thought you might be able to recommend some possible books for her. Thank you Shary. We have not heard of the blog “A Year of Reading the World” but will check it out. Looking forward to the recipes! Just got back from Georgia and have made several khachapuris since then, but none have been as good as the real deal. Your pictures look great! Gaumarjos! Thank you! We published an Acharuli Khachapuri recipe today. When we leave the dough in a warm place, how warm it should be? Is there any specific temperature we have to keep? We published the recipe today Kevin. Enjoy! We eat it a lot here – it is delicious! I love khachapuri (ate a lot of the real stuff in Georgia, and have also sampled versions made in New York and Chicago), but my attempts at making it always flounder. Yesterday, I tried one of each, and the Adjaran one turned out OK, but the other two tore and started squirting cheese out while I was flattening the dough ball and as a result I couldn’t flatten them enough. Then, they both got super thick in the oven, making it more like eating a piece of cake than a thin slice of khachapuri! (Still tasty, but not something I’m ready to bring to a party yet!) Any suggestions? Hi–yes, I used the recipes for the 3 variants you posted here. I’m pretty sure the problem was with the dough, though, since it burst in a few places and then puffed up so much in the oven. Perhaps I need to knead it more and make it stiffer? Hi Matt, yes it does need quite a bit of kneading. Good luck with your next attempt. Don’t give up! Hi! 1st time to your site when i was browsing for Khachapuri. I never tasted it before but heard lot abt it recently from my new Georgian friend. Ur recipe is very tempting to try. Do you mind to give the conversions of Kilos into Cup??? I really appreciate your help. This will help me to have accurate measurements. I am dying to try/eat this for 1st time. Looking frwd to get a reply from you asap. Thanks a lot! Keep up with your great work. Did I do something wrong? I put it in a warm place (an oven, but I turned it off so it’s just hot air) for two hours and nothing happened. I followed the recipe exactly. I am sorry to hear that. Was your yeast ok? I think the problem wasn’t the yeast but the flour. The thing is that flour can be translated as two different words in Dutch (my native language), and they mean two slightly different things. I used something also called wheatmeal, which is brown and grainy, and so was the dough. Next time I will use the other one, which is a white and smooth powder. how many cups would 1.15 kilos of flour be? Thank you for posting these wonderful photos and recipes. I may have missed any mention of the kind of flour you use? Here in the USA we generally have “white flour (without the bran and germ)” and “wholewheat flour(generally with the bran)” and sometimes “GRAHAM flour (with the whole bran and germ)”available. I got thick, doughy bread that was way too thick. Baking is very tricky if you don’t know what you’re doing… and I don’t. Sorry to hear that. Don’t give up. 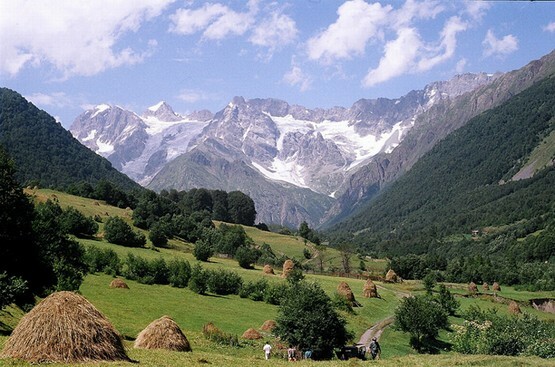 Thank you very much for so many nice Georgian recipes on this website. This is the most extensive website I found so far. I have a Georgian cooking book as well, but the khachapuri did not work out all that well. I will try this one soon! Thank you for your message. I am delighted that you like the recipes. We frequently add new ones. I hope your next khachapuri is successful. can some one tell me the amount of yeast, flour, oil, milk and water is needed to make enough dough for only one khachapuri? Hi. 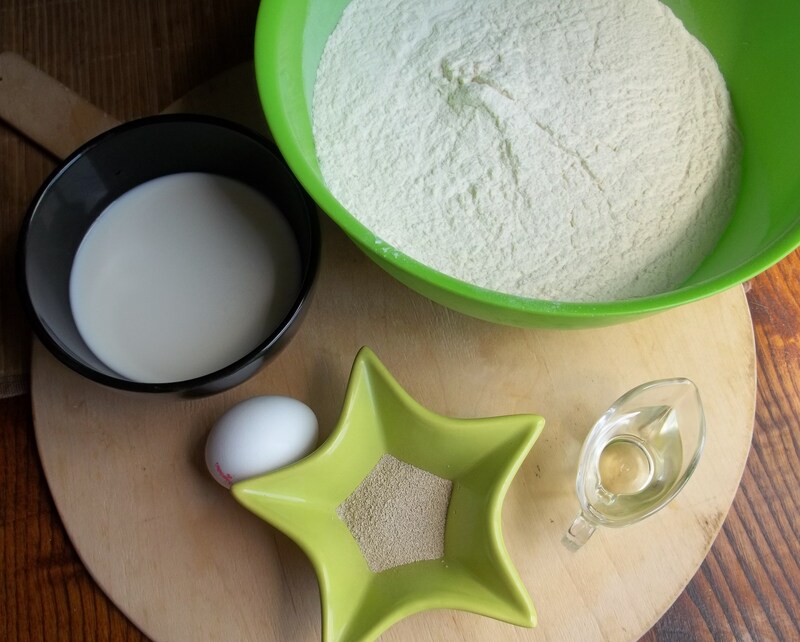 To make one khachapuri: 400 grams of flour, half tsp of yeast, 120 ml of milk or water, 1 small egg, and up to 20 ml of oil. 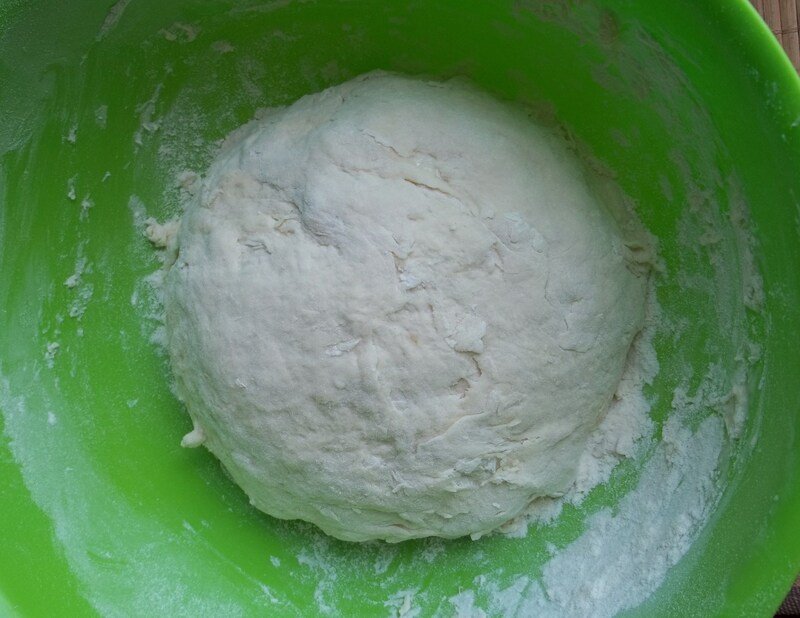 In khachapuri Dough Recipe had to add more water, 1kg of flour and 400ml water/milk mix … it came out very very hard dough. Added about 200+ml water, then was nice and soft dough. Followed the recipe but the dough was “tasteless.” Are you sure there is no salt to be added to the ingredients list? Usually, Georgian cheese is quite salty and the dough does not require any salt. However, some people do add salt. It’s a matter of personal taste. at what tempurature and for how long should i bake it? ?